The Apostle Paul said, "...the husband is the head of the wife as Christ is the head of the church, his body, and is himself its Saviour" (Eph. 5:23). Paul is saying that like Jesus, with His bride (the church), it is the husband's responsibility to make certain that his family, including himself, knows Jesus Christ as their Saviour and Lord; and receive the Baptism of the Holy Spirit. The role of the husband is not the boss who has the last word on everything, but he is the one responsible to help guide his family in a right relationship with Jesus. "I am the good shepherd. The good shepherd sacrifices his life for the sheep" (John 10:11). Jesus spoke this parable to them: “What man of you, having a hundred sheep, if he loses one of them, does not leave the ninety-nine in the wilderness, and go after the one which is lost until he finds it? And when he has found it, he lays it on his shoulders, rejoicing. And when he comes home, he calls together his friends and neighbors, saying to them, ‘Rejoice with me, for I have found my sheep which was lost!’ I say to you that likewise there will be more joy in heaven over one sinner who repents than over ninety-nine just persons who need no repentance" (Luke 15:7). "However when He, the Spirit of Truth (Holy Spirit), is come, He will guide you into all truth; for He shall not speak from Himself, but whatsoever He shall hear, that shall He speak; and He will show you things to come" (Jn 16:13). "For the word of God is living and powerful, and sharper than any two-edged sword, piercing even to the division of soul and spirit, and of joints and marrow, and is a discerner of the thoughts and intents of the heart" (Heb.4:12). It is the husband's responsibility to encourage his family to use the Gifts of the Holy Spirit (Rom. 12:6-8;1 and Cor. 12:8-10) so that they can all be witnesses (Acts 1:8) for Jesus Christ. It's is upon the husband to develop "worship" (1 Cor. 14:26) in his own home so that when the family participate in a church fellowship, they know how to worship "God in spirit and in truth" (Jn. 4:24). The husband cannot do everything, but must encourage every member of his household to listen to the Holy Spirit (Rev. 2:7) for guidance on how they are to participate. Apostle Paul commands "husbands, to love your wives (Eph. 4:25)." Of four different Greek words for "love” in the bible, agape (ä-gä′pā) love is the only kind of love that we can be commanded to use (1 Cor. 13:1-4). But we must first receive God's perfect (agape) love though the baptism of the Holy Spirit (Rom. 5:5), before we can minister it to others. Paul's wife (1 Cor. 9:5) must have been shocked when Paul arrived home after meeting Jesus on the road to Damascus road (received the Holy Spirit) when Ananias prayed with him. (Acts 9:4-19; 1 Cor. 14:18). The mistake that too many Pastors and Christian teachers make is to use Old Testament people as examples for today's believers. Like the Proverb 31 woman, who is used as an example of the model Christian women- she had no rights under the Old Testament law (2 Chron. 1:11-12). We need Christian wives and husbands who are born again, spirit-filled, who are baptized with the Holy Spirit and have the gifts of the Holy Spirit (Rom. 12:6-8; 1 Cor. 12:8-10). 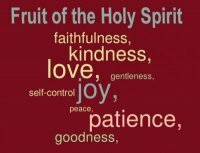 We need Christian parents who have the "fruit of the Spirit" (Gal. 5:22-23); who have the character and "mind of Christ" (1 Col. 2:16); who pray together about everything (Eph. 6:18), and who "volunteer" to minister to each other, their families and in the church. Such parents prepare their children, each other, friends and strangers, for the kingdom of Heaven. I know this because I am married to such a wife. We need spirit-filled "New Testament" people who are guided by the Holy Spirit (Jn. 15:7-15) everyday and who will witness and volunteer to minister to everyone. Let's make America great again by starting with our families!